The act of successfully scoring a waza in kendo. 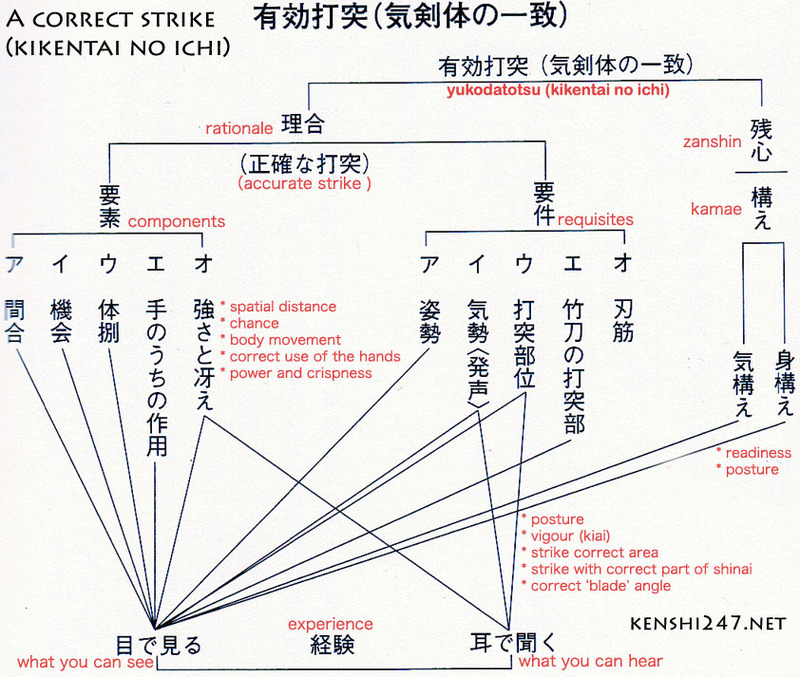 The act of striking with ki-ken-tai-no-itchi. A term which expresses an important element in moving for offense and defense; it is mainly used in teaching striking moves. Ki is spirit, ken refers to the handling of the shinai, and tai refers to the body movements and posture. When there three elements harmonize and function together with the correct timing, they create the conditions for a valid strike. Making a valid strike. A valid strike which is considered ippon. According to the rules, a waza is complete when the following conditions are met: showing a fullness of spirit and appropriate posture, striking a datotsu-bui (striking zone) of the opponent with the striking region of one’s own shinai while using correct ha-suji, and expressing zan-shin. If the necessary conditions are met, ippon is also given in the following cases: when ones strikes the opponent as soon as the opponent drops his/her shinai, steps out of court, or falls down, and when one strikes the opponent just as the signal for the end of match is given. Ippon is not given in the following cases: when both players simultaneously make valid strikes and when one player makes a valid strike but the opponent shows full spirit and proper posture and the tip of his/her shinai is on the front of the chest of the striking player. After a bit, he frowned and then said to me, “Well, it seems whatever it is that decides a point seems to be understood by those that practise kendo, as they not only fairly acknowledge strikes when they are called (generally unanimously by the judges), but the kendo-experienced spectators (i.e. the majority of people there) tend not to disagree.” Hmmm, I thought. Although now I can almost certainly rattle of what it is that makes an ippon, there are still elements of it that can only really be appreciated by those that do kendo. People that do kendo know what a good strike feels like (to do and to receive) and they just know good style when they see it. Often this is hard to verbalise. A year or so ago I found a chart that attempted to explain what an ‘ippon’ is. Its definitely accurate and can be used as a great resource to explain to people with less (or even no) experience what constitutes an ippon. However, it cannot of course define those elements that are beyond verbalisation. At any rate, here is the chart for you to check out (click to enlarge). Have a look and see what you think. Any thoughts on yuko-datotsu in Jodan? Obviously a Jodan players shinai cannot touch the opponents chest as the opponent attacks. I have always understood that if a jodan player remains indominable and maintains a constant awareness such attacks can be ignored? but the question niggles in the back of my mind…why the attack wasn’t recognised and pre-empted by the Jodan player… the only answers I can think to this are 1) the Jodan player was fast asleep, or 2) his mental focus was so strong he disregarded it. But then I’m reminded by other kendoka, what is written above… namely that if the strike is on target (lets say kote to a jodan player) and the aggressor finishes with all the other elements of yuko-datotsu is this a point? At a superficial level (my level 😉 ) I think if the jodan player remains motionless and forward focused it is not a point, but if the jodan player flinches or unconsciously reacts its almost certainly a point. Note that I mention that there are “elements that are beyond verbalisation” at the end there… I think you are talking about one of them. What is given by an “ippon” in a shiai is (meant to be) objective based on the decision of three shinpan. A “real ippon” – I posit – can only be decided mutually between the two kenshi involved. Whats shown in the diagram above, and what is defined by the ZNKR, is simply a guide. There might even be times when you feel that you have lost to a strike that didn’t actually hit you accurately…. (just as there are times you are struck accurately and with all the elements listed above yet it doesn’t “feel right”). At the end of the day, a lot of this is based on experience, attitude, and where you are going with – even why you are doing – kendo. I’ll leave it there. Hope it makes sense. I think it’s interesting because it adds to the “requisites” (which have always been the definition of yuko datotsu according to Article 12 of the Regulations), the “components” which shinpan and shiaisha alike have known were also necessary but which remained “unwritten”. Nice document… maybe I will see if I can promote it on here. Is this explicitly written in the regulations ? Do you mean that if you hear the whistle and go for an ippon it can be considered as valid even though the yellow flag is raised and the opponent is already out of the shiai ? As long as “yame” hasn’t been called you can score. There are plenty of rules that are ignored or interpreted in a, say, free manner.